After six town meetings, two extensive discussions at Board of Trustees' meetings and an intensive weekend-long retreat in October 2011, the Lasell College community produced a high-level strategic plan that provides the basis for a shared understanding of how our institution will move forward in the coming years. The 21 bullet points on page three of the report, Vision 2017, collectively represent a picture of what we expect to find different about Lasell College in the Fall of 2017 from what exists today. Our campus encompasses 53 acres within the neighborhoods of Newton, Massachusetts, eight miles west of downtown Boston at the crossroads of Route 128 and the Massachusetts Turnpike. Lasell's location puts students within easy reach of the cultural, health care, and business opportunities of the Greater Boston area. Several public transportation options are just a short walk from campus. Lasell College engages students in the practice of their fields of study through collaborative learning that fosters lifelong intellectual exploration and social responsibility. Data are presented to be consistent with national reporting guidelines for graduation rates as defined in the Student Right-to Know Act. These guidelines specify that only students who are (1) first-time college students during the fall semester and (2) enrolled full-time during their first semester are to be included in each yearly cohort. Each cohort is then tracked for 6 years. Students not tracked for graduation rates include: students who begin college in the Spring; students who begin college as part-time students; graduate students; and students who are transfers from other colleges. All colleges that participate in federal financial programs are required to report graduation information to the Integrated Postsecondary Education Data System (IPEDS) for its Graduation Rates Survey. The national average for private four-year colleges in 2010 was 55.1% and for public four-year institutions the national average was 39.6% (www.ACT.org). 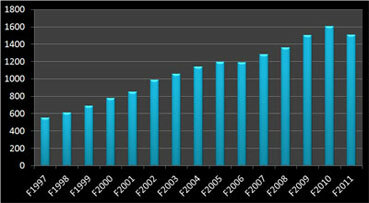 The 2010 graduation rate for Lasell was 51.04% and the 2011 rate was 46.5%. First-year retention is defined as the percentage of an initial cohort (as defined above) enrolled at the same institution one year later (i.e., freshman to sophomore year). The national average for private four-year colleges in 2010 was 68.7% (www.ACT.org). Lasell's three year average is 68.9%. 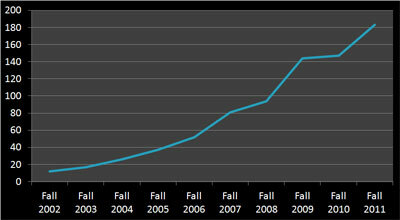 Enrollment at Lasell College has steadily climbed over the last ten years and College enrollment is at an all time high for fall 2012. Over 98% of our undergraduates attend full-time. Undergraduate students represented 23 states, Puerto Rico, and 21 countries in Fall 2012. Graduate students represented 35 states and 21 countries in Fall 2012. Lasell College embraces a diverse community. In recent years, the percentage of minorities in the undergraduate student body has increased significantly. Lasell College faculty are committed to creatively integrating challenging coursework with practical experience in an environment that fosters lifelong intellectual exploration, active citizenship and social responsibility. Our approach to technology is based on the College's philosophy of connected learning, infusing the physical and online classroom environment with the most current systems, web sites, and social media. Lasell College provides multiple opportunities for global learning. Using the home tuition model enables greater numbers of students a chance to experience a college sponsored international experience. Lasell College offers more than 40 undergraduate and graduate academic programs and a deep commitment to Connected Learning. We'll engage you—and challenge you to apply what you learn—through a host of creative initiatives on campus, in our community, and among the cultural, health care, and business opportunities of nearby Boston. Lasell College is a member of the NCAA Division III and the Great Northeast Athletic Conference (GNAC). There are 17 varsity sports. Currently, more than 80% of Lasell's undergraduate population lives in campus-owned and operated facilities. The residential community at Lasell College consists of 26 buildings: three traditional residence halls, three suite style residence halls, five hotel style residences and fifteen victorian houses. Lasell College is patrolled 24/7 by academy trained police officers with power of arrest in the Commonwealth. Lasell College offers a wide range of financial assistance through federal, state, local and institutional programs. Fees: see complete Undergraduate fee schedule.